A key debate during North Carolina’s 2012 election cycle revolved around the proposed development of 164 acres in southwest Durham County, an area now widely referred to as 751 South. The development called into question zoning practices and decisions, as the Durham Planning Commission finally approved 751 South to be rezoned from its former Rural Residential designation to a Low-Medium Density Residential designation. Yet even as Southern Durham Development (SDD), the company spearheading the project, moves forward with its plans, environmental activists and local community leaders have spoken up against the development, citing an irreversible environmental impact, including damage to Jordan Lake and its aquifer. Amidst the political debate, this paper seeks to examine whether or not the 751 development will be beneficial to Durham using economic analyses. We first review the origins of zoning policies to gain a better understanding of the sensitivity of rezoning. 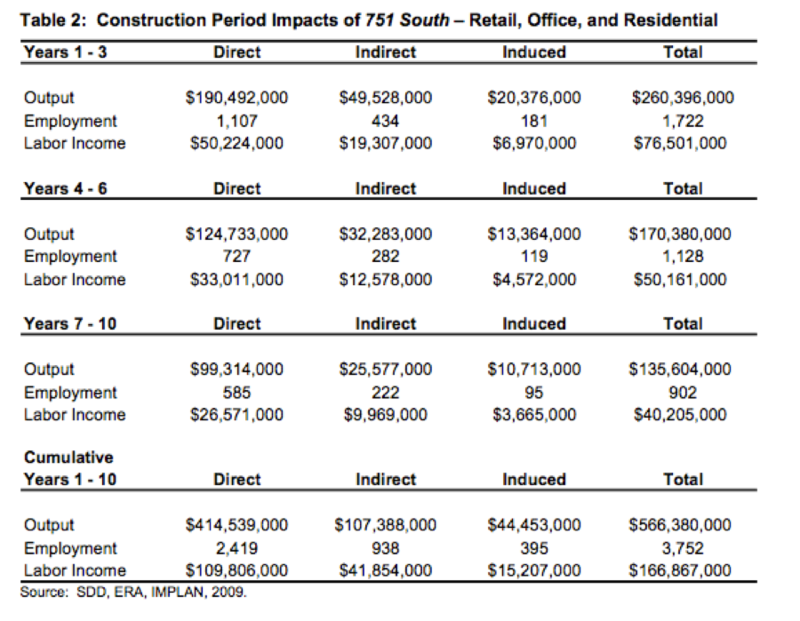 Then, we look more deeply into 751 South and the research that has been conducted about the project, including an independent economic impact analysis and a cost-benefit analysis by Durham County. From the data available, 751 South is a viable and necessary development that will bring a great deal of benefits to Durham County, ranging from job creation to privately-funded highway improvements. The practice of zoning as a method of urban planning and land use regulation has been surrounded by equity and segregation debates over the past few decades. A wide body of literature about the topic exists, with a range of focuses, from its early implementation in the early 1900s to its efficiency to its effect upon race and class segregation. This paper examines the history and progression of zoning practices and policies, as they are crucial to understanding the associated controversies. We then look into the impact of zoning upon income distribution and equity, first through a more dated but resourceful paper by Fernandez and Rogerson (1997), and then through a 2006 paper by Calabrese, Epple, and Romano. Lastly, we explore literature concerning the relationship between zoning laws and public health initiatives. Fischel (2004) offered a comprehensive overview of zoning from its early 1900s origins to modern day policy reforms to address the exclusionary products of such regulations. Fischel posited that zoning was not a necessary practice until the advent of buses and trucks that allowed businesses to locate farther from streetcar tracks and stations. Until then, workers were able to buy houses in the suburbs without fear of encroaching business. However, companies’ newfound capability to transport resources threatened the residential environment that workers found so valuable. Thus, zoning was the only way to give homeowners security and assurance that their neighboring land wouldn’t become a noisy business district. Several decades later, the problem was exacerbated by a sudden increase in highway construction in the 1960s. Firms could now move out of high-density urban areas even more easily. Failing or struggling cities and suburbs welcomed the influx of businesses for the accompanying fiscal benefits. Meanwhile, only well-off communities could afford to keep businesses out. Fischel argued that it was in this environment that income distribution began to play such a strong role. In this paper, he sought to find a way to keep home values stable, as zoning was initially created to accomplish, without causing the exclusion with which we are faced today. To resolve this, he proposed selective home equity insurance, despite his acknowledgement of the administrative problems and risks of moral hazard and adverse selection. Fernandez and Rogerson (1997) and Calabrese et al. (2006) investigated the impact of zoning upon equity, but differed in their approaches in a critical way. Both used a two-community model with two different income distributions. Both also made a point of stratification as a natural occurrence, with or without zoning laws. But the former required in their model that individuals committed to one community or another before any voting took place, and before they bought any property. Calabrese et al., on the other hand, based their argument upon the Tiebout rationale that people could “vote with their feet” and choose to reside in towns that align with their personal preferences. Thus they arrived at different conclusions. Fernandez and Rogerson found that in general, zoning made the richest better off and the poorest worse off, but left a great deal of ambiguity about those in the middle. Poor individuals who moved from a more affluent community to a lesser one because of zoning policies tended to be better off, while individuals who move to a richer community tend to be worse off. Calabrese et al. finds an overall increase in efficiency and welfare as a result of zoning, due to their assumptions under the Tiebout model. They conclude that because residents can move after a community votes on tax rates and local public goods, “aggregate welfare gains arise from better Tiebout matching of preferences to levels of public-good provision” (Calabrese et al. 2006, 4). Comparing these two scholarly works highlights a decisive factor in zoning theory: that the order in which individuals vote on taxes and public goods, buy property, and choose their community affects the predictions of the ensuing welfare gains or losses. Until July 2012, the 751 South region was designated as Rural Residential, which permits four or fewer units per acre of land. Since the Durham Planning Commission approved the rezoning application by a vote of 8-5 in favor, 751 South is now a Low-Medium Density Residential area and is allowed anywhere from four to eight units per acre of land. SDD’s plan for the development allocates 300,000 square feet to retail space, 300,000 square feet to office space, 645 apartments, 358 condominiums, 170 townhomes, and 107 single-family houses. Their plan also includes a 26-acre donation to Durham to build a new elementary or middle school, a new fire department, and a new sheriff’s office. Finally, SDD has committed to investing the full $6 million needed to improve Highway 751 to expand its capacity and relieve congestion in the area. The economic impact of the 751 project come in two phases: the construction phase and the permanent operating phase. Benefits, as outlined by the ERA Economic Impact Analysis, come in many forms, the most significant being in job creation and increased property and sales tax revenue. Other benefits include SDD’s full funding of the highway renovations and planned donation of 26 acres of land for the purpose of constructing a new public school, and new sites for the fire and police departments. In total, the value of these contributions exceeds $11.4 million, saving the expense of taxpayer money. The costs that have been examined include the costs to construct, the cost to equip and staff new fire and police departments, and other operating costs of the new landscape. Overall, without any reliable data on environmental costs, the benefits to developing the 751 South project exceed the costs by a tremendous amount. This building phase of the 751 South project brings changes in three components: direct, indirect, and induced impacts. Direct impacts refer to the initial changes in industries; indirect impacts refer to changes in inter-industry transactions as demand grows; and finally, induced impacts refer to changes in local spending that result from the changes in the industry sectors. Intuitively, any development dollars spent and re-spent in Durham County will generate additional income for both companies and their employees as money circulates through a cycle of spending. ERA acknowledges that there will be some leakages, so this multiplier effect will not be entirely contained within Durham County, but overall the benefits are significant. Figure 1 breaks down the impacts into three construction phases over ten years, noting the three types of effects upon output, employment, and labor outcome. The economic impact of the operating activities of retail, office, and consumer spenders is permanent and proves more substantial than the Phase 1 impacts. 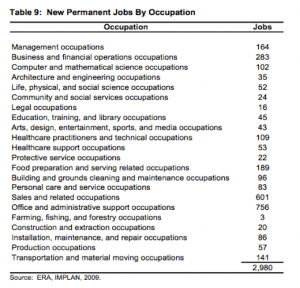 The benefits can be broken down into jobs and income, household spending, and tax revenue. First, using data from the American Planning Association, the new retail and office buildings will house 1,050 new professional office jobs and 683 new retail jobs. Additionally, the new occupants who will occupy the housing at 751 South will create demand for 714 other jobs for a total of 2,980 new jobs at build-out with an estimated annual labor income of $154.2 million. 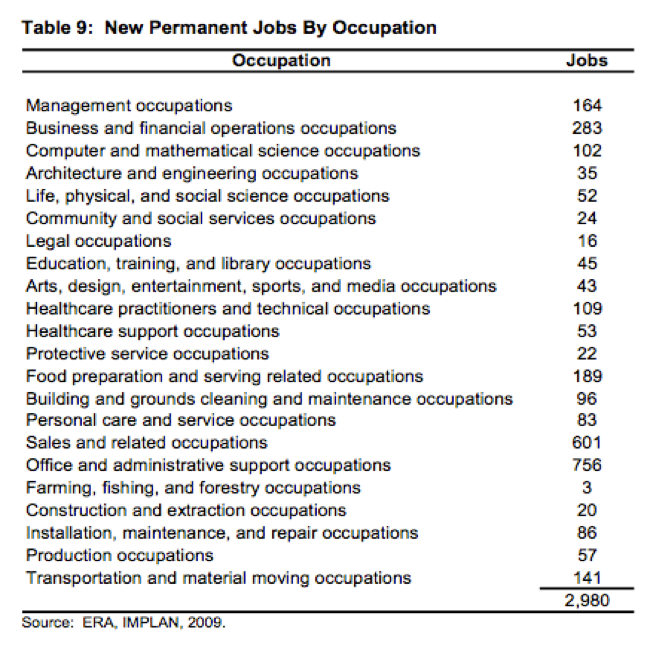 Figure 2 provides an exact breakdown of the predicted permanent jobs, which range from construction positions to legal personnel. Second, 751 South is predicted to house 1,280 new households with a total estimated disposable income of over $98.9 million that will contribute to the new industries and businesses in the area. Finally, the new development is forecast to bring in about $5.7 million in annual property taxes to Durham and additional revenue in sales taxes. Data based upon local experience and internal market research examined similar communities such as Colvard Farms and Meadowmont and yielded estimates of $3.2 million for Durham County with an additional $2.4 million for the city if the project area is annexed. The two economic analyses provided suggest that development in full of SDD’s project for 751 South would be the appropriate policy decision, but fail to acknowledge any environmental impact research that may reduce the perceived benefits of the development. 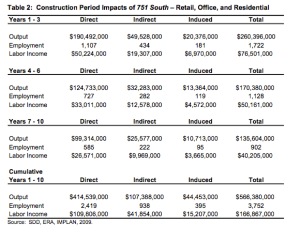 The economic impact analysis by ERA explores the various benefits that will come from 751 South, ranging from sales and property tax revenues to thousands of permanent jobs to privately-donated land for Durham Public Schools, the Fire Department, and the Police Department. The cost-benefit analysis by BMS demonstrates that full completion of SDD’s proposal would bring profits sooner than any alternative scenario. Intuitively, completion of only 48.1% or 21.9% of the project yields slower returns and fewer returns for a lower investment. The policy question comes down to a balance between environmental risks of developing 751 South and other needs that 751 South would help fulfill for Durham. While maintaining the status quo would eliminate the environmental concerns, this option leaves Durham with many of its problems unsolved. Overcrowding in Durham Public Schools will remain an issue, as will the traffic congestion along the 751 and NC-54-I-40 corridors. While the existing economic studies have revealed a number of economic benefits that would accompany the 751 South project, there has yet to be conducted an official environmental impact assessment that would lend credence to the environmental objections to it. Without such evidence, a fully informed policy choice cannot be formed. Prepared for Southern Durham Development (March 29, 2009), www.era.aecom.com. Annexaction Petition (March 31, 2011), ww2.durhamnc.gov/annexation/751_Report/pdf/04.pdf. Thus they arrived at different conclusions. Fernandez and Rogerson found that in general, zoning made the richest better off and the poorest worse off, but left a great deal of ambiguity about those in the middle. Poor individuals who move from a more affluent community to a lesser one because of zoning policies tend to be better off, while individuals who move to a richer community tend to be worse off. Calabrese et al. finds an overall increase in efficiency and welfare as a result of zoning, due to their assumptions under the Tiebout model. They conclude that because residents can move after a community votes on tax rates and local public goods, “aggregate welfare gains arise from better Tiebout matching of preferences to levels of public-good provision” (Calabrese et al. 2006, 4). Comparing these two scholarly works highlights a decisive factor in zoning theory: that the order in which individuals vote on taxes and public goods, buy property, and choose their community affects the predictions of the ensuing welfare gains or losses. Finally, we examine more recent literature relating zoning codes and public health solutions. Ransom, Greiner, Kochtitzky, and Major (2011) define the “built environment” as anything man-made or man-modified, from buildings to highways, that act as sources of pollution (94). They draw linkages between the built environment and health, and cite the disproportionate cases of obesity in densely-packed urban areas as a prime example. It follows that zoning codes should take public health considerations into their analysis, as the City of Baltimore did in its 2008 TransForm Baltimore campaign (Public Health Work Group 2008). The planners endeavored to create an environment that allowed people to be healthy through such measures as increasing green spaces, establishing more mixed-use space, and controlling the locations of fast food stores and liquor stores, especially relative to schools and residences. However, Ransom et al. did identify a number of obstacles to pursuing such zoning policy reform. First, the research and evidence to support these reforms is complex, both to accumulate and to transform into actionable policies, as the precise causal effects of certain zoning layouts upon health problems is difficult to determine due to confounding factors, such as population demographics, the types of businesses occupying retail and office space, etc. In other words, the effects of zoning are difficult to isolate from other characteristics of a neighborhood or community. Second, using zoning to address public health issues is politically difficult, especially when other priorities exist, such as improving walkability and access to healthy food (Ransom et al. 2011, 96). Third, efforts such as the TransForm Baltimore initiative lacks input from a variety of community members and leaders, which prevents policymakers from fully comprehending the context. Lastly and perhaps most importantly, business leaders and neighborhood housing associations are well-organized constituency groups that often oppose things such as mixed-use land, mixed-income housing, and reduced parking requirements. The existing research addresses several arguments in favor of and against zoning, and the diversity of the literature opens many doors for further research. In the case of Durham, North Carolina, it may be worthy to investigate the impact of Duke Hospital upon the surrounding residential neighborhoods and efforts to preserve a certain environment despite increased traffic. A similar analysis may look into zoning designations in the Warehouse district downtown, and who made the decisions to make one set of warehouses into the American Tobacco District and another into the West Village apartments. Durham, as a growing city, stands to see more conflicts in the coming years as businesses grow and residents face the potential intrusion that people feared a century ago. Calabrese, Stephen, Dennis Epple, and Richard Romano. “On the Political Economy of Zoning.” July 2006. Fernandez, Raquel and Richard Rogerson. “Keeping People Out: Income Distribution, Zoning, and the Quality of Public Education.” International Economic Review 38:1 (1997), pp. 23-42. Fischel, William A. “An Economic History of Zoning and a Cure for its Exclusionary Effects.” Urban Studies 41:2 (2004), pp. 317-340. Public Health Work Group, “Zoning Recommendations.” Transform Baltimore, City of Baltimore, 17 November 2008. Ransom, Montrece McNeill, Amelia Greiner, Chris Kochtitzky, and Kristin S. Major. “Pursuing Health Equity: Zoning Codes and Public Health.” Journal of Law, Medicine & Ethics (2011), pp. 94-97. I am interested in exploring the efficiencies and inefficiencies of zoning and land use regulation in the U.S. To this end, I will briefly look at the history of zoning and some major events that shaped how it has been exercised. Then I will present the findings of several studies concerning the practice and examine where that leaves us today. In his paper on property value maximization, Brueckner (1983) builds on Tiebout’s broad idea of governments achieving efficiency in a community by maintaining its population subject to the minimum individual cost of public goods and services. Brueckner’s analysis of governments that engage in property value maximization while allowing for private land and property markets (the effects of this behavior on land rent and house size are ignored), proposes a more concrete application of Tiebout’s original idea. Brueckner (1983) showed that communities are internally in Pareto-efficient equilibrium when their governments maximize the value of aggregate property by selecting their public good output provided that government revenue is collected by a per-house tax. If the same revenue is being collected with a distortionary tax, such as income tax, the same community will be internally efficient, but not internally Pareto-efficient (it is important to note that the paper did not clearly define an “efficient allocation” as clearly distinct from Pareto efficiency). However, this government strategy of value maximization cannot achieve a globally efficient equilibrium. The reason for this is that in the model the zero-profit utilities between communities will differ depending on the community population and its tastes. The Nash equilibrium of government behavior with respect to maximization of property value ensures the internal Pareto-efficiency mentioned prior; however, it does not always assign community consumers optimally, which leads to global inefficiency. Fischel (1992) runs into similar complications with regards to quantifying zoning efficiency in large areas. However, instead of lack of Pareto-efficiency, he argues that zoning is less effective in large cities rather than in suburbs and rural areas due to the heterogeneity of larger populations’ interests. Bruckner suggests that a government-applied population control such as zoning could be the key to achieving global efficiency. The reasoning behind his statement is that such restrictions can make the population’s tastes more homogeneous by excluding lower income residents and thus increasing efficiency in communities where taxes are distortionary. However, the effective introduction of zoning into the model is a problem that has yet to be solved and requires further research. One factor that must be taken into consideration is that studies of zoning and growth regulations have not yet yielded a unanimous and statistically significant proof of such practices’ effectiveness in all areas, or their consequences. Fischel (1992) claims that even though studying zoning is a challenge given the abilities of governments to amend the laws due to new political environments, it is possible to extract broad conclusions, both because the laws governing the states are similar and because of the effects of the Standard State Zoning Enabling Act of 1922. However, Quigley and Rosenthal (2005) in their paper on the effects of land use regulation argue that the complex interrelationship between demand for housing, availability of public services and conditions for them makes the implementation of an optimal regulatory framework a daunting task for any municipality. Fischel (1992) claims that many studies show that “adoption of more restrictive zoning reduces the value of undeveloped suburban land subject to restrictions and increases the value of already-developed homes.” However, this does not unambiguously prove zoning laws’ effectiveness. Quigley and Rosenthal (2005) examine results from various studies in order to assess what conclusions can be drawn regarding the effectiveness of zoning. Several quoted studies largely failed to demonstrate the effectiveness of monopoly zoning on property values, until an analysis by Thorson (1996) showed promising results. Thorson analyzed reported median home values using more complex models, which included neighborhood and housing quality controls, where his concentration ratio turned out to be significantly related to increased home prices. Other studies restricted to certain areas in the U.S. concluded that zoning has little to no effect on property values. However, some of the later studies that address challenges in existing methodologies confirm the positive effects of zoning on property values. According to Quigley and Rosenthal, a lot of these articles show that regulations of land use raise the value of existing property, but diminish that of developed land, which is the same result at which Fischel arrived. However, Quigley and Rosenthal determine that the overall effect of density regulations on property values is ambiguous. They conclude that it is not possible to make any definite generalizations about the effect of zoning and land use restrictions onto property values, which contrasts with Fischel’s more optimistic view. It seems that Pareto-efficient equilibrium can be achieved in various communities by the optimization of a public good and thus maximizing property value (Brueckner 1983). This finding provides a partial theoretical solution to one of the problems government have on their agendas, but further research must be done in order to reach a globally Pareto-efficient equilibrium. The way Brueckner proposes this issue to be solved is through the use of zoning. However, there are a lot of unsolved problems that need to be addressed before a global property-value-maximization model can be developed. Quigley, John, and Larry Rosenthal. “The Effects of Land Use Regulation on the Price of Housing: What Do We Know? What Can We Learn?.” Cityscape. 8.1 (2005): 69-137. Web. 7 Feb. 2013. Fischel, William. “Property Taxation and the Tiebout Model: Evidence for the Benefit View From Zoning and Voting.” Journal of Economic Literature . 30.1 (1992): 171-177. Web. 7 Feb. 2013. Brueckner, Jan. “Property Value Maximization and Public Sector Efficiency.” Journal of Urban Economics. 14. (1983): 1-15. Print. Thorson, James. “An Examination of the Monopoly Zoning Hypothesis.” Land Economics. 72.1 (1996): 43-55. Web. 7 Feb. 2013.